Do you have the patience for playing around with lots of fiddly paper bits? If so you might enjoy collecting paper scraps and making them into interesting greeting cards. I’ll show you how gluing small bits of paper to strips of scrap cardstock can give you exciting design options. Ephemera from travel – maps, brochures, tickets, etc. 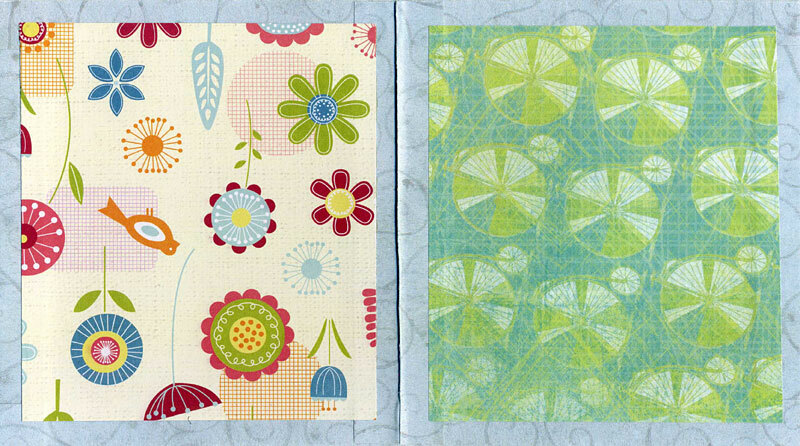 I’ll show you two different card designs that you can make by collaging scraps of paper onto cardstock strips. 1. Cut some strips from plain scrap cardstock that are 1/2 to 3/4 inches wide. Old folders are a good source of scrap cardstock weight paper. 2. Lay out a bunch of small paper scraps and glue them down in a row down each strip. 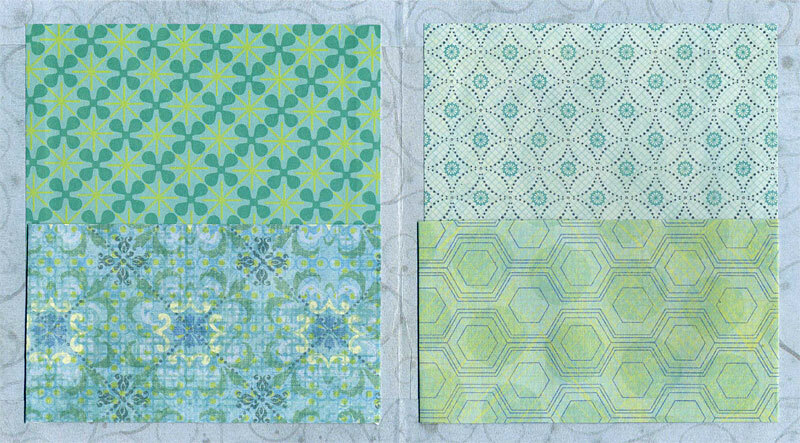 You might choose papers at random or try to follow a planned color scheme. When glue is dry enough to handle, use a scissors to trim the strips from the back to make the edges even. 3. Choose a color of rubber stamping ink that will help unify your design and squirt a little of it onto an old food lid. 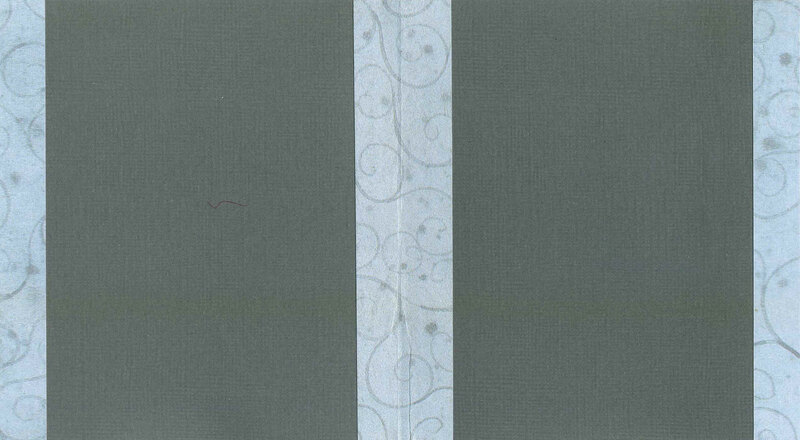 Dip the edge of a flat-sided eraser in the ink and apply a line of ink to the edges of your collaged strips. This is a small step that makes a huge difference in the visual appeal of your finished piece. The strip at the lower left is in the process of having scraps glued to it. The middle strip has been trimmed and the upper right strip has been stamped along the edge with rubber stamping ink. 1. Print a selection of sentiments with permanent rubber stamping ink on strips of light colored paper to use on the card that you make. Select one to use as the main theme of your card. Rubber stamped sentiments on strips of scrap paper. 2. Choose a piece of scrap cardstock or heavy paper to use for the base of your card. Fold it in half. Measure the front of your card. 3. Next select a piece of thin scrap paper that would make a good background for the front of the card. Tear out a piece that is 1/2 inch smaller than the front of your card, using the metal ruler as a tearing aid. 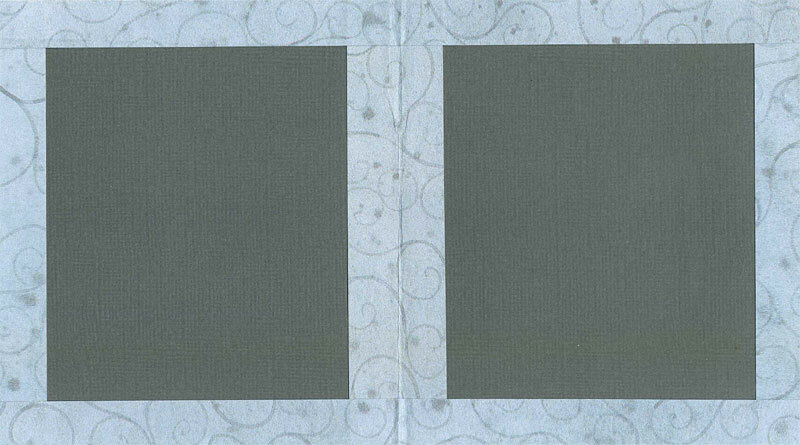 For example, if you fold an 8 1/2 x 5 1/2 inch piece of paper in half, the front of the card will measure 4 1/4 x 5 1/2 inches and the background paper for the front of the card should be 3 3/4 x 5 inches. 4. Next choose a simple shape to put on the front of the card – you could trace around a found object, use a cookie cutter or a stencil as a source. Trace one copy of this shape onto plain scrap cardstock. Make another tracing on the back of a piece of paper that harmonizes with the chosen colors for your card. 5. Cut out both shapes with scissors. Set aside the one in the harmonious color to glue to your card later. 6. Take the shape on plain cardstock and glue your sentiment across the middle or wherever looks best. Just below the sentiment, glue a section of one of your collaged and inked strips from earlier. 7. Moving from the inside to the edges, glue strips of scrap paper in complementary colors on either side of your sentiment and collaged strip for a striped effect. Cut around the base shape to trim when all covered. 8. Using the glue stick glue the colored shape you cut out earlier to the front of the card. 9. You will probably need some more robust glue to hold the collaged and inked shape since all the layers of paper will have made it pretty thick. Use Yes Paste to attach the striped shape to the front of the card. Trim if needed. 10. If needed, glue plain light colored scrap paper to the inside of the card to make a clean area for writing a message. This second card design is designed to made from a piece of 4 1/4 inch by 8 1/2 inch cardstock. 1. Fold the cardstock in half and the front of the card will end up as a 4 1/4 x 4 1/4 square. 2. Cut a 3 3/4 by 3 3/4 inch square from plain scrap cardstock. 3. Glue a sentiment, a collged and inked strip and scrap paper strips to the cardstock square. 4. Trim around the square and round the corners with a corner rounding tool. 5. Glue the trimmed square to the front of the card with Yes Paste. Cover up unwanted parts of found papers by laminating with other paper. You can get wrinkles out of paper by ironing. How does one glue down delicate tissue paper? Stabilize by gluing to a stiffer piece of paper with a glue stick and smooth out wrinkles with a bone folder. When working on other projects, if you have leftover paint or ink use it up on plain paper scraps. Save these scraps and add to them whenever you have leftover art media. In time, you will have a lot of interesting scraps to work with. If your paper project warps or curls, press it between heavy books with clean scrap paper around it to protect both card and books. 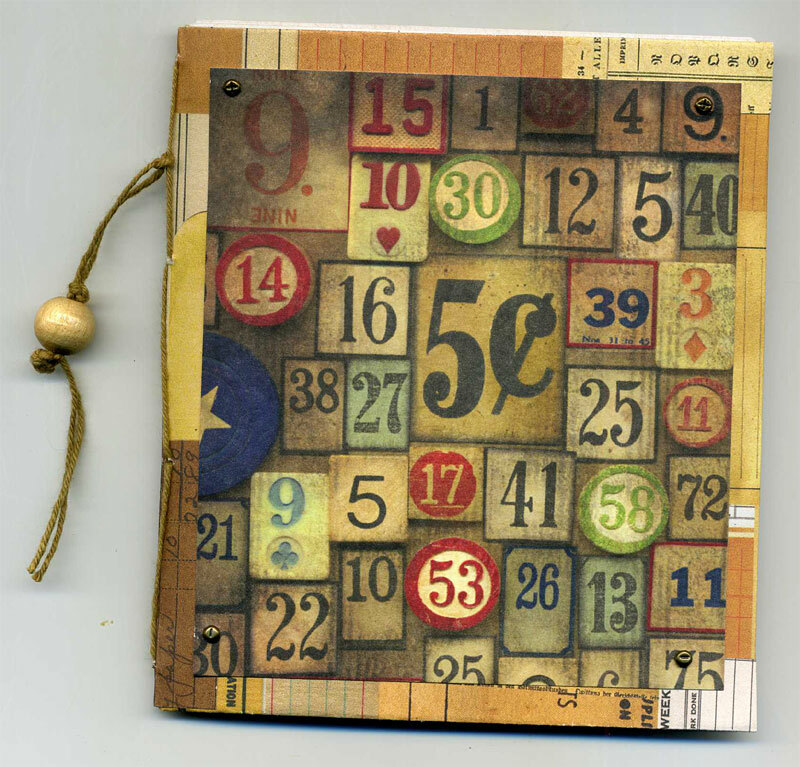 I make a lot of 6 x 6 inch pages for handmade journals. When you cut a 6 x 6 inch piece of paper out of an 8.5 x 11 piece of paper you’re left with a lot of leftover 8.5 x 5 inch pieces. Here is a project that will use up those extra pieces and possibly some of your other paper scraps as well. If you’re a regular reader of mine you know I try not to waste anything! 1. Download the template Mini Album and print it out to use as a guide. 2. Cut out a piece of 8.5 x 4.75 inch card stock. Fold in half. 3. Out of decorative papers, cut 2 8.5 x 1 pieces and 4 4.75 x 1 pieces. 4. Fold one of the 4.75 x 1 inch pieces lengthwise and make a sharp crease with the bone folder. Flatten out and apply glue to the back. Glue down on the inside fold seam and burnish well (see A on template). Glue paper piece to the inside fold seam. 5. Fold and glue two more 4.75 inch pieces to the edges (see B on template). Fold two more pieces to the edges and glue down. 6. Fold and glue 8.5 x 1 inch pieces to top and bottom edges (see C on template). Burnish all well. Glue two pieces lengthwise along top and bottom edges. 7. Fold another of the 4.75 x 1 inch pieces lengthwise and make a sharp crease with the bone folder. Flatten out and apply glue to the back. Glue down on the outside spine and burnish well (see A on template). 8. Cut out four pieces of 4.25 x 3.75 inch decorative paper. They can be all the same or all different. Glue to the front and back covers, inside and out. If you want to decorate the front cover further with more embellishments you can. Burnish all well. 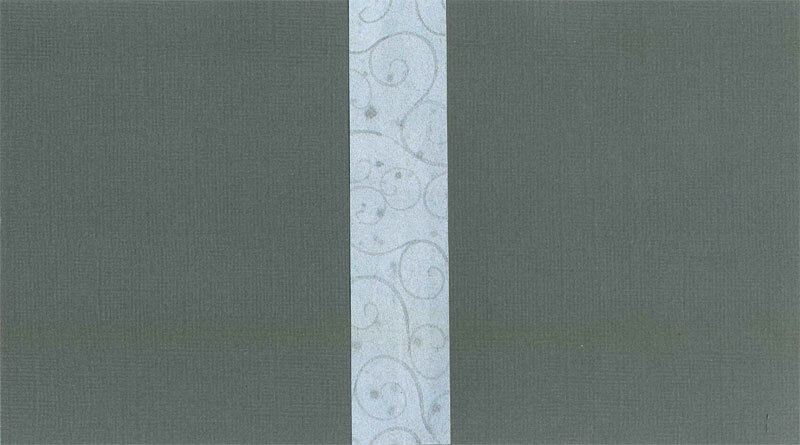 Glue decorative papers to front and back covers. 9. Cut out front and back pocket pieces, fold in tabs and tape in place with double-sided tape. Add pockets to inside covers. 10. Cut out twelve pieces of 8.25 x 4.75 text-weight paper. Fold all in half and nest pages. Use paper cutter to trim the paper that sticks out. 11. Using template as a guide for placement, punch four holes in the front cover with an awl, needle tool or small hole punch, and four holes in the back. Push brads in holes. 12. Using template as a guide, punch small holes in spine of paper and album cover with awl or needle tool. 13. Cut off a piece of cord that is about 28″ long. Thread the cord onto a needle and poke into the top first hole from the outside in, leaving about 7″ of cord trailing. 13. Run cord through the rest of the holes according to this sequence – second hole inside to out, third hole outside to in, fourth and bottom hole inside to out, third hole outside to in, second hole inside to out, then tie off. Add beads to cord if you want.